The plot focuses on the business of the agencies as well as the personal lives of the characters, regularly depicting the changing moods and social mores of the United States in the 1960s. The series began on March 1960 and ended on November 1970 with the conclusion of season seven. Don Draper (Jon Hamm) is the focus in the series, initially as the talented creative director at Sterling Cooper and later a founding partner at Sterling Cooper Draper Pryce, as are the people in his personal and professional lives. 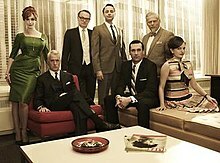 ^ a b "Mad Men ��� Season 2 Reviews". Metacritic. Retrieved February 14, 2012.